New City. New Terror. Maximum DEMORN! Bay City is home to the Soul Fights and a welcome respite from the War. Demorn, exile and assassin, has journeyed across the Glass Desert to aid an old friend. But the conflict that is tearing apart Firethorn follows her to the city. As a catastrophic comet descends upon the Bay, Demorn fights to untangle a web of conspiracies surrounding her friends and enemies alike. As she uncovers past sins from those she trusts the most, Demorn is slowly drawn into a desperate, last-ditch plan to avoid the destruction of everything, never sure where her loyalties lie. 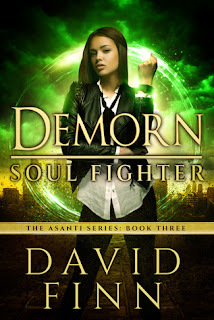 I started reading Demorn with the first volume, Blade of Exile, a few months ago and though my inability to force order on the events persisted through the second book, City of Innocents, and into this third volume, Soul Fighter, I continued to find myself caught up in each and every chapter and sentence. I felt like I'd found myself dropped in the middle of an intense car chase. I didn't know who was chasing whom but the cars were beautiful, the drivers were intense and hilarious, the passing landscape and buildings made it impossible to keep my eyes on the road and the special effects were frickin out of this world. Oh, and did I mention since Soul Fighter hits many other POV's than just Demorn's, her wisecracks take on an ultra layer of humour when heard through the lens of someone else. 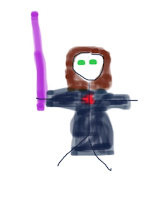 I also loved how easy it is to picture Demorn and the other characters. They have a very superhero feel and don't change their outfits every second page. If I could draw anything more than stick figures ... well stick Demorn will have to suffice. This reliable imagery coupled with 'signature' expressions give the story a fun comic book/video game feel. Couldn't resist. Demorn is awesome and Soul Fighter is intense and addicting. Get some of that gymnasts chalk, coat up your hands and hold on. I received a mobi copy from the author in exchange for my honest opinion.